Russian. 10-16 oz., pink, heart-shaped tomatoes with meaty flesh, few seeds and little juice. Excellent flavors. Prized heirloom from the 1930's. 3-4”, heart-shaped, tomato with few seeds and luscious flavors. One of our favorites! 1920s Italy. 12 oz., 3” long, paste tomato. Shape varies: banana shape to a heart-shape. Excellent sweet flavors. Prolific 2 1/2 -3”, jade-pink, heart-shaped, firm tomatoes with juicy, delicious flesh. Great slicer and garden staple. Popular from 1925. Productive, 1-2 lb., juicy, meaty tomato with few seeds and mild, luscious flavors. A garden staple. Beautiful, 3”, heart-shaped tomato with a subtle, vertical striping. Good all-purpose tomato. Delicious! A pink sport of Russian 117. 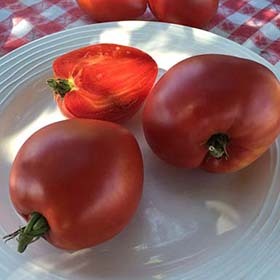 10-14 oz., heart-shaped, meaty tomato that boasts excellent flavors and garden appeal. Productive, 12-16 oz., heart-shaped, tomatoes with excellent flavors. Good slicer for sandwiches and salad. 1 lb., heart-shaped tomato in clusters of 5 to 6. Delicious, sweet flavors. Join those who trust in this garden-gem. From Italy. Lots of beautiful, red, 10-12 oz., heart-shaped, meaty tomatoes. Very flavorful. A SPLENDID slicer. 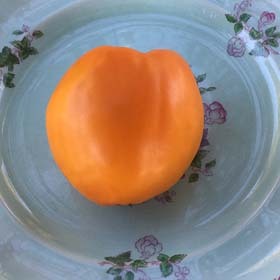 10-20 oz., pink, heart-shaped tomatoes with high shoulders and few seeds. Great well-balanced fruity flavors. WINNER! Big Tomato contest winner.10-16 oz., deep-pink, heart-shaped, juicy tomato with thick skins, and few seeds. WOW! From Crotia. 10-16 oz., blocky, heart-shaped tomatoes with meaty flesh and few seeds. Delicious, robust flavors. RARE. Copious amount of delicious, robust flavors with a lingering sweetness. Perfect for slicing into sandwiches. HUGE, 1-2 lb., meaty, rose-pink, heart-shaped tomatoes with thick walls and wonderfully sweet flavors. A winner! One of our best oxheart tomatoes. HUGE, 1-3 lb., heart-shaped tomatoes that are deliciously full of assertive flavors. Kentucky heirloom. “Amazing, delicious and beautiful.” HUGE, 1-2 lbs., red, oxheart tomatoes with full, flavors. 14 oz., oxheart, gold-colored tomatoes. Sweet, tropical fruit flavors. If you try it you will love it. RARE. A FAVORITE for 100 years. Distinctively beautiful, 1-3 lb., yellow-gold, heart-shaped tomatoes. "WOW!" RARE.